A total of six coke drums for the Chevron El Segundo Refinery were replaced by Chevron to help ensure the continued operation of the refinery. Two coke drums safely transported on twelve lines of SCHEUERLE SPMT. 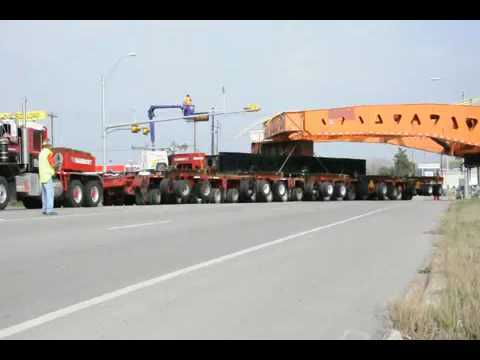 In order to avoid repositioning the SPMTs between different freights, to match the length of the column and to ease mechanical stress on the load, spacers between the vehicles are used. The massive new drums traveled 7,330 miles from Spain to the Port of Los Angeles. Twelve axle lines of SCHEUERLE SPMT, connected with a suitable spacer, did a great job handling the bulky load. The new drums will be installed in the same location within the refinery, replacing the current drums, which are nearing the end of their useful life. Dutch international heavy lift and specialist transport company Mammoet has placed and order for 650 lines of SPMTs with Scheuerle. The deal – for more than 25 percent of Mammoet’s total SPMT lines – brings its total to more than 3,000 lines. Generator continues the turn onto Hwy 21 from Hwy 6 feeder after a little more room is made by taking down a sign post on Saturday 01-23-2010. 30 years ago, the first SCHEUERLE SPMT was developed and delivered to a company that is today the world’s leading provider of heavy transport and lifting – Mammoet in the Netherlands.In this 30-year period, SPMT has written transportation history. The management of SCHEUERLE and Mammoet as well as the management and owners of TII Sales and TII Group met at Pfedelbach to celebrate the 30th birthday of the SCHEUERLE Self-Propelled Modular Transporter (SPMT). 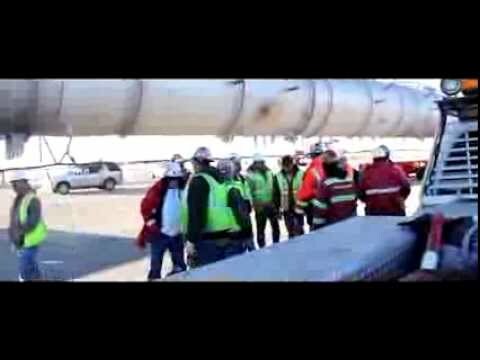 In this respect, Mammoet has been the initiator: if the 2,012 axle lines purchased by Mammoet with a total loading capacity of around 100,000 t were coupled together one after the other, then the 330 m high Rose Tower in Dubai – one of the tallest buildings in the world – could be loaded nine times over. Worldwide, more than 8,000 SPMT axle lines from Scheuerle are in regular use, an impressive fleet of vehicles that “moves the world”. Jan Klejn, CEO at Mammoet and Otto Rettenmaier, owner of the TII Group, cut the birthday cake for the 30th Birthday of the SCHEUERLE Self-Propelled Modular Transporter (SPMT). In the background: Herman Smit, COO at Mammoet and Fabian Weingart, member of the Rettenmaier family. Mammoet and SCHEUERLE celebrated their joint success on 26.06.2013 in Pfedelbach, the birthplace of the SPMT. Otto Rettenmaier, who acquired SCHEUERLE in 1988 and subsequently integrated the business into his TII Group in 1994, was also present on the occasion of this milestone anniversary.”Today, we look back at a joint success story stretching back over 30 years. This is not only a cause for celebration but also an incentive not to rest on our laurels. Close proximity to the customer will also be our priority in the future”, said the Heilbronn multi-entrepreneur. 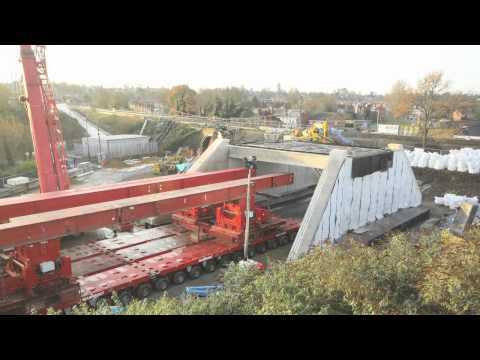 How a big Dredger of 1813 tons can be moved overland across 14 Kms!! News, Projects, Shipping, Transport Comments Off on How a big Dredger of 1813 tons can be moved overland across 14 Kms!! 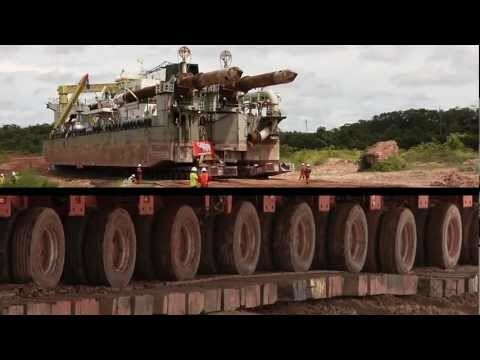 This documentary shows the impressive mobilization mission of a Boskalis dredge ship of 1813 tons and its supporting vessels through the jungle of Suriname. Boskalis contracted Dutch transport experts Roll-lift and Mammoet for the mobilization of ‘The Orion’ vessel from AbuDhabi to the bauxite mine at Lelydorp near Paramaribo and across land and bridge over a distance of 14 kms to its final destination. 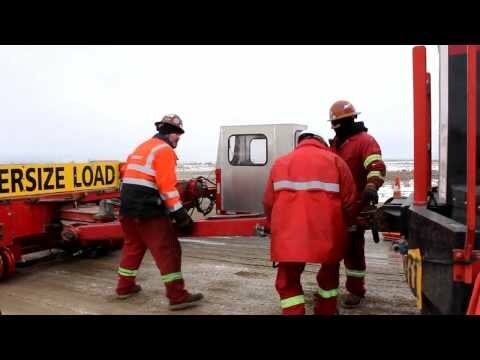 More of the heavy hauling to Fort McMurray.